It is time for another two-week grocery haul and menu plan! This time I decided to do most of my shopping at Aldi. Sometimes I can get amazing deals at the grocery store with sales and coupons, but I just didn’t have the time or energy to put all that together for two weeks at once! Aldi was a great choice and I am really excited about what I was able to find! You will see in my grocery haul below that I made a quick trip at my regular grocery store for chicken, bacon and ground turkey. I’m using the slow cooker several times during the next two weeks – I love coming home from a long day and having supper all ready for me! However…last week I put a beautiful beef roast in the slow cooker and headed to work. All day long I dreamed of the delicious BBQ beef sandwiches we would be enjoying for supper. I got home around 6:30 and was HORRIFIED to find that the power had blipped off and back on around 10 AM. My beautiful beef roast was disgustingly room temperature and perfectly raw. I nearly cried. Has that ever happened to you? I am wondering if I should plug my slow cooker into a surge protector next time?! 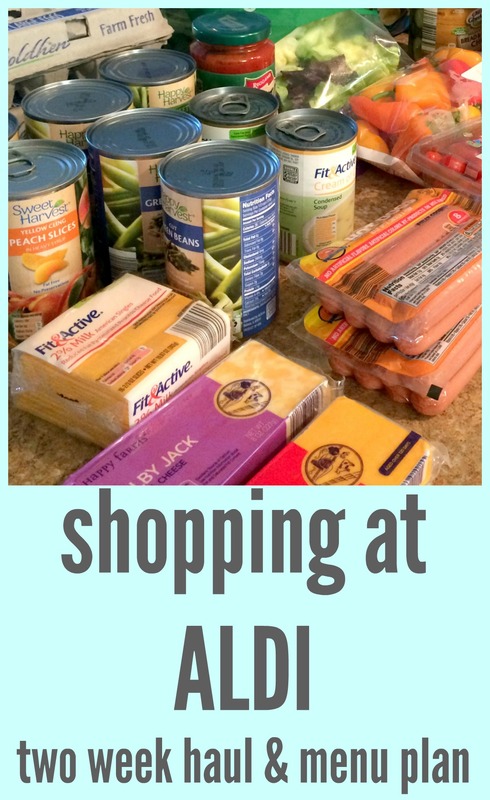 Aldi Grocery Haul: One Week of Meals for $50! Have you tried a two – week menu plan? Let me know what worked for you! I love the prices at our Aldi’s but…I got tired of my food being thrown into the cart as I check out. I asked the clerk why she was doing that and she said she would get into trouble if she took too long checking me out. Ha! Thanks, Wendy. 🙂 Those lunches might work for small children but not for me! Thank you, thank you, thank you! I’m on an incredibly tight budget this pay period and this is just what I needed. How many people does this 2 week list feed? There are two adults in my house, but the meal plan could easily be expanded to feed more people by increasing the amount of groceries purchased. About how much did your haul come to? I am sorry to hear about your slow cooker fiasco. That is so disappointing! Thank you for your sympathy – it was a sad moment to discover that raw, ruined roast! I wish we had an Aldi close by. I really need to have you here to help me grocery shop. You always have great hauls. I wish we could shop together sometime! Aldi is expanding everywhere -maybe you’ll get one soon! What a bummer about roast! But I LOVE Aldi! Their produce rocks! You have some great projects here! I would love it if you’d share some at our link party! Thank you, Lori! I’ll be sure to visit you! GAH!!! That crock pot story has me super bummed for you! That’s the point of a crock pot dinner – to have dinner ready when you come in. What a disappointment! I don’t know if a surge protector would work? Who knows. But loving your 2 week menu concept. I’m thinking of adapting something similar post-baby. Do a 2 week menu and then just do it over and over again for a few months until life settles down… same grocery store, same grocery list. That’s not a bad idea! Hit up Costco and stock up on everything all at once and be done! My name is Jennifer…and I tried contacting you my email (here on your blog). I was just wondering if you received the email? I had someone, yesterday, say they did not receive (a work) email….so I thought I would check. Hi Jennifer! No, I didn’t receive your email. You can send me a message at facebook.com/homeforcomfort if that’s easier. Hope you’re having a great day! Oh NO!!! I totally would have cried. That did happen to me once, but I caught it an hour later. So sorry :(. It was the saddest thing! I went to Aldis the other day and picked up some great produce and milk at a wonderful price. I may stop by there every now and then to get the bargains. And I have to say again how pretty your dessert looked on Instagram. I love old glass ware and it makes me happy to see a young lady who likes it too!! Aww, thanks friend! I love those dishes too! It’s a good idea to find out what day they get a new truck of produce and shop that morning. Sometimes it’s feast or famine with produce at Aldi, and knowing the truck day makes a difference.